For homeowners looking to purchase a new home or renovate their current one in the Moore community, sewer camera inspections are valuable tools that can help you determine the quality of your pipes and ensure that they are in good condition. At NuFlow Oklahoma, we offer sewer camera inspections for these situations, ensuring that our customers are informed and comfortable with their pipeline systems. Sewer camera inspections with NuFlow Oklahoma eliminate concerns about what can’t be seen. Exposing problems inside the pipes with crisp, clear video footage is part of what makes our sewer camera inspections so innovative. Our sewer camera inspections are capable of revealing corrosion, leaks, joint damage, clogs, cracks, and leaks in the pipes regardless of their size. The cameras are sent through your pipelines on a flexible cable, allowing us to carefully assess every bend and turn in your pipes. With no area left unnoticed, we will have a comprehensive look at your pipes and ensure that our results and diagnostics are accurate. These high-quality inspections are particularly valuable for sewer systems in a home that is at least fifty years old. These older systems don’t have the benefit of being built with advanced, durable materials and resources, making them more likely to suffer from corrosion and other complications that can negatively affect the system. 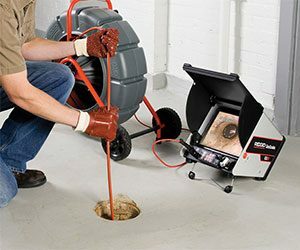 Sewer camera inspections will pinpoint these problems ensure that the best solution is reached with modern techniques. At NuFlow Oklahoma, not only do we offer our sewer camera inspections to diagnose pipeline problems, we are also equipped with the tools to solve them. We help our customers save thousands of dollars by ensuring that our customer’s sewer lines are safe and secure. For homeowners looking to buy a home, maintenance on a property before buying it can eliminate future problems and ensure that your system is covered and will function properly for many years. With regular maintenance and thorough inspections, we can help prevent clogs from becoming cumbersome by removing them in the early stages of buildup, preserving the quality of your bathtubs, toilets, sinks, and pipeline system as a whole. In addition, these proactive safety measures ensure that accidents such as floods and sewer backups don’t afflict your home and damage your furniture and other valuables, saving you money in the long run by avoiding costly repairs. With NuFlow Oklahoma, we have the experience necessary to restore your pipes and accurately diagnose problems with our sewer camera inspections. Founded in 1998, our company strives to save our customers time and money on repairs, and this practical and effective process ensures safety and efficiency in your sewer system. With the most advanced, constantly developing technology, we have the best solutions offered at an affordable price with quick turnaround, and you can be rest assured that your pipes will be secure with us. If you live in Moore and are interested in learning more, call NuFlow Oklahoma today for more information about our sewer camera inspections and how they can help you.